This poetry is about complexity of the commonplace and mysterious connection. Pretty relishes humanity’s contradictions and frustrations. He’s on top of his craft, shrewdly observant, witty, practical rather than flashy, never tired. in the Library of Forgetting. to answer, a fiction I will never recall. Her face. The nightingale. I sailed away. Black sails. Background knowledge of Theseus helps here as this poem is packed with the legend’s imagery, and readers who do not know that connection will miss a great deal. In the last two lines above, for instance, the short sentences are significant yet are not explained; it’s surprising that a poem with many external allusions was chosen to open the book. Still, it’s a striking piece. Typically, Pretty supplies enough information to make his poems self-contained and approachable to the reader (he is, after all, primarily about communication). He enjoys himself playing with tropes that invoke King Lear, Juliet, Lazarus, Rupert Brooke and Keats … yet, occasionally, the lines sag to a bit cheesy: ‘Hey, Rupert, I’ll brook no interference’, from ‘Rupert’. a filigree of ice on the window tree. The language is inventive and sharp throughout the book, but these poems have destinations, plenty to convey and believe in getting on with it. Beneath the conversational tone, a narrative drives. The collection’s range is broad. There’s sly humour in ‘Barista: A Love Story’; Australian attitudes are satirised in ‘Anthem’ when ‘my anthem sings of citizens tired of politics / and all who threaten them with the future’; and apocalypse follows in ‘The Last Half Hour’. Such a pretty little child. Is it yours? looks again from parent to cinnamon child. Apart from exploring contemporary legal and moral issues, poems in this section operate as metaphor for the randomness of life, birth, and have yet a third resonance – ruminating on Australia’s ‘stolen children’. 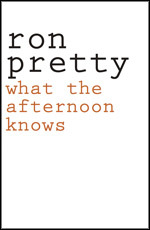 In a poem titled ‘Envoi’, Pretty begins with a Swedish proverb, ‘The afternoon knows what the morning never expected’. The poem reflects on life from his isolated childhood to the discovery of teaching and women (in random order), love and children and an afternoon full of writing. This is a rich collection from a life well examined. This entry was posted in BOOK REVIEWS and tagged John Upton, Ron Pretty. Bookmark the permalink.